This is the best and easiest recipe I would say! I don't need to tell you how nutritious Spinach is and also how difficult it is to make kids like it. But this recipe will never fail you. My daughter now asks for this chips everyday! Wash the Spinach leaves and pat dry them with a paper towel. Take a small bowl and add the oil, salt, pepper and mix well. Put the leaves in the bowl and close it with a lid and shake them well so that the oil is coated lightly on all the leaves. Arrange the leaves on a microwaveable plate and microwave it for 1 min on High. Crispy Spinach chips ready to serve! 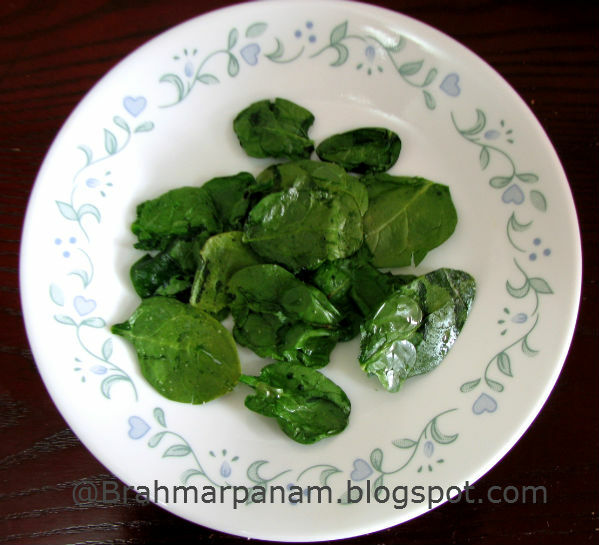 If the Spinach is not very crisp heat it for 10-20 secs more but be careful not to burn it. Add chat masala or any other flavouring of your choice and enjoy the healthy snack. You will not be able to stop with 1 batch. I make kind of 5-6 batches for just the 2 of us. Very easy n healthy recipe!! Thanx for linking it to the event..Please add the logo too,Deepa..
Do drop by & join my space too!